Installing beadboard ceilings in your cabin or home is an easy way to add vintage-feel and character. 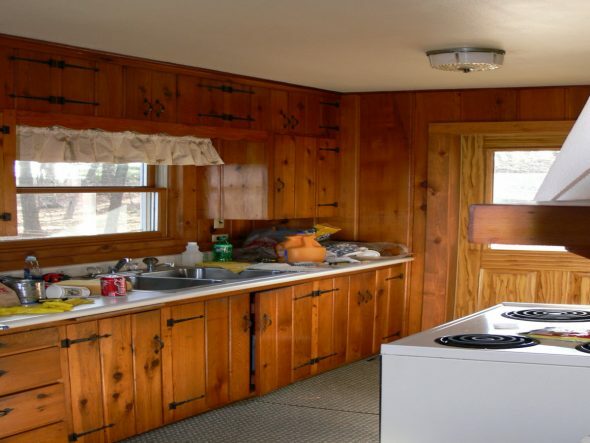 When we remodeled our cabin, we did just that. Beadboard or beaded ceilings are created using wood tongue and groove boards assembled to build a paneled finish. 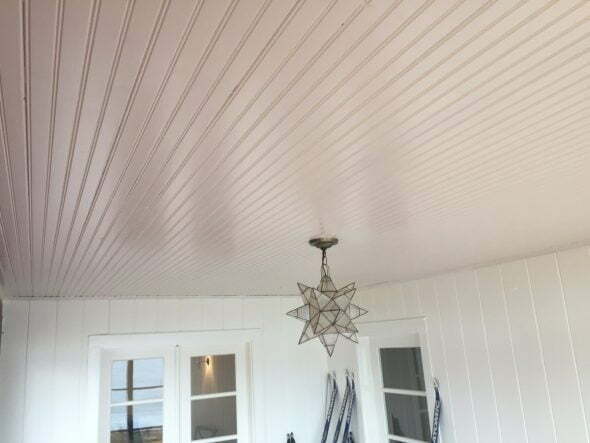 Beadboard became popular in the 1800 and 1900’s when it was used as a durable, inexpensive, surface for ceilings and walls (known as “wainscot” when combined with trim elements). Today, wainscot and beadboard paneling remains popular as a functional, low-cost, traditional-feeling finish and perfect for cottages and cabins. Read on to learn more about beadboard and how to install beadboard yourself. Although authentic beadboard is built using individual tongue and groove boards, today beadboard surfaces can be created using a few different products. In addition to traditional beadboard, built from single tongue and groove boards, larger manufactured, beadboard-patterned panels are used to create a beadboard-appearing finishes. Knotty pine 3/4″ x 4″ tongue and groove v-groove beaded boards. While I strongly prefer using individual tongue and groove beaded boards to create beadboard finishes, manufactured panels do offer speed and cost savings. The trade off is an off-the-shelf, paneling look that lacks the character, depth and feel of true beadboard created from individual boards. That said, there may be installations that benefit from thinner, lighter beadboard panels made from a variety of materials including solid wood, hardboard, MDF, and polymers. These panelized products, especially those that are resistant to moisture, may have improved performance in certain environments or under certain building constraints. Beaded tongue and groove boards are available in a variety of dimensions, and are made from an assortment of wood species (pine is common), engineered wood and polymers. For my project, I used 3/4″ x 4″ x 12′ pine beaded boards purchased from my local lumber yard. Solid wood beaded boards, like any solid wood product, should be moisture stable and acclimated to the environment you plan to install it in. Purchase kiln dried products and allow them to acclimate to you home prior to install. Consider the timing of installation if your climate and home have significant seasonal humidity variations. Boards installed during drier months will tend to expand during more humid ones and vice-versa. Plan accordingly, but allowing adequate expansion gaps for changes in humidity and anticipate board contraction during dryer times. Primers and preliminary coats of clear finishes can and should be applied prior to installation when possible. Pre-applied finishes help protect and stabilize boards. For much of my board and batten ceiling install, I first applied several coats of primer to all sides of the boards prior to installing. Then, after installing the boards, I only needed to apply a finish coat to ceiling. 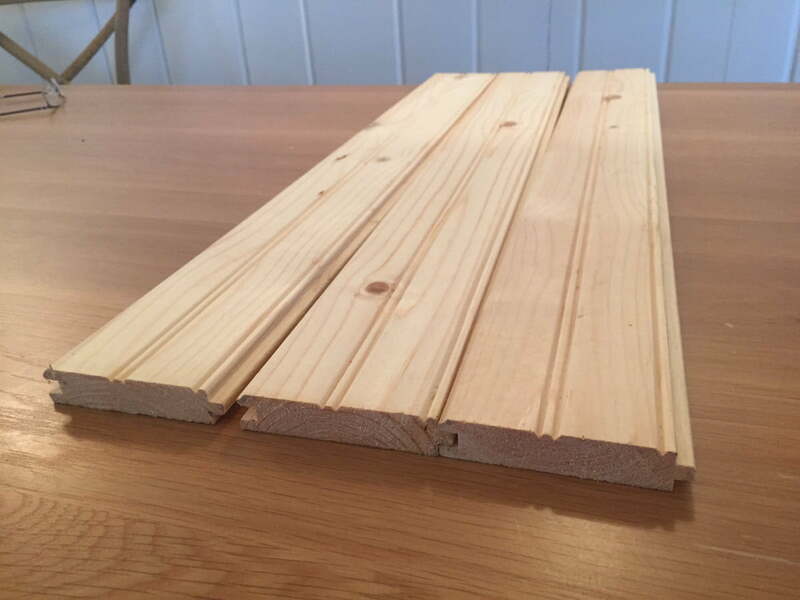 Pre-finishing tongue and groove boards are also beneficial in preventing the boards from showing unfinished tongue and groove surfaces if boards expand and contract with seasonal changes in humidity. Pine tongue and groove beaded board primed with two coats of primer prior to installation. Solid wood boards will expand and contract more than manufactured products with changes in humidity. Consider the environment when planning your beadboard finishes. In bathrooms and other high humidity environments, solid boards may not be the best choice. If you do plan to install solid wood boards in these areas, the boards should be well sealed on all six sides to help protect them from moisture. Choosing a wood species that performs well in humid conditions may also be helpful (teak, cedar, others). In high-humidity environments, consider alternative products instead of solid wood. Manufactured exterior grade beadboard planks and paneling that may perform better. You may also consider avoiding wood finishes (like beadboard) in these areas. Although we added beadboard to our kitchen, bedroom and porch ceilings, we skipped it in our bathroom. 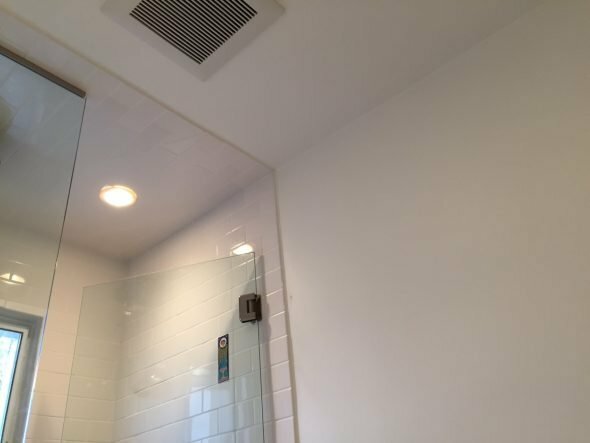 We installed beadboard ceilings in most rooms, but avoided it in our bathroom. Instead, our bathroom ceilings are painted tile backer board. Solid wood boards may require more substantial fastening compared to paneling. Thinner, lighter panels, with greater dimensional stability can often be installed with construction adhesive. Heavier, thicker individual boards are typically nailed, and installed perpendicular to framing studs. 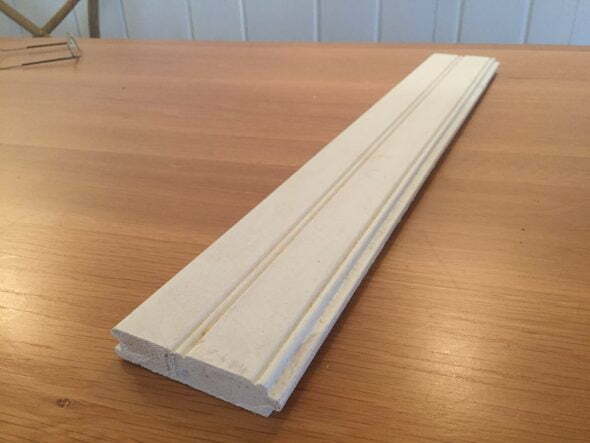 While running beaded boards perpendicular to ceiling studs is usually not a problem, it offers challenges for a wainscot style application on walls. Initially, we wanted to install beadboard ceilings in our bedrooms. Once they were up, we couldn’t get enough, and we added them to our kitchen and porch ceilings as well. White beadboard ceiling in our hallway. Beadboard ceiling in bedroom. Beadboard built with 3/4″ x 4″ pine beaded boards which were painted white. 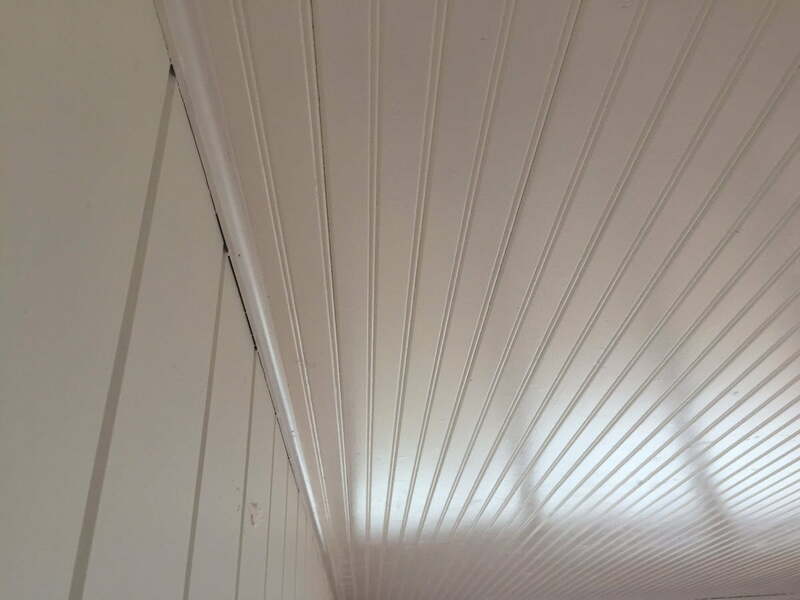 White beadboard ceiling in porch. 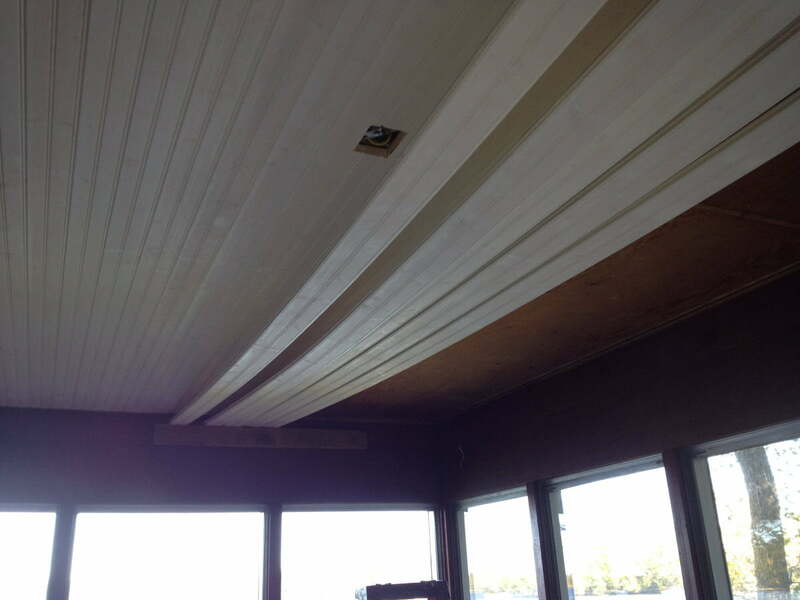 Again, beadboard ceiling built using 3/4″ x 4″ beaded pine tongue and groove boards painted white. And in the kitchen as well – white kitchen beadboard ceiling. Original cabin drywall ceiling prior to beadboard ceiling install. Porch ceiling before porch beadboard ceiling install. 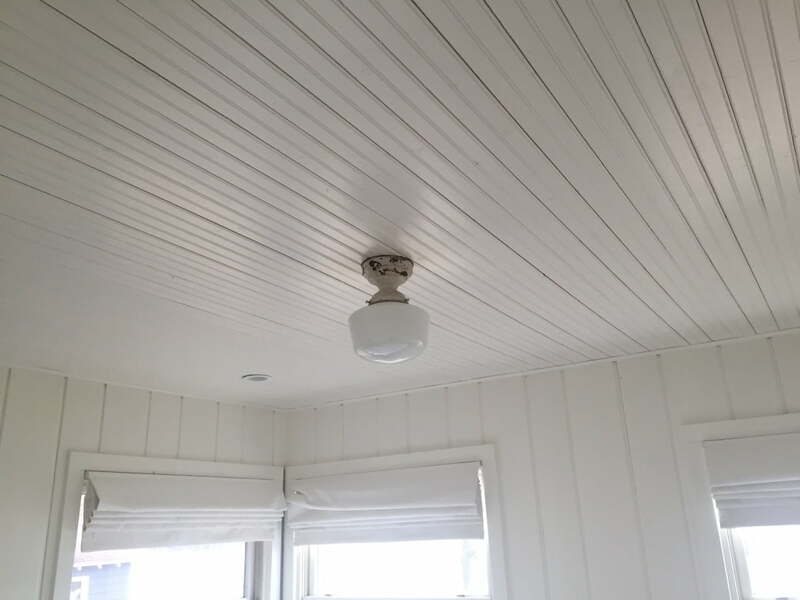 Our new beadboard ceilings add character and a vintage feel to our cabin. They were relatively inexpensive and were an easy DIY project for most. 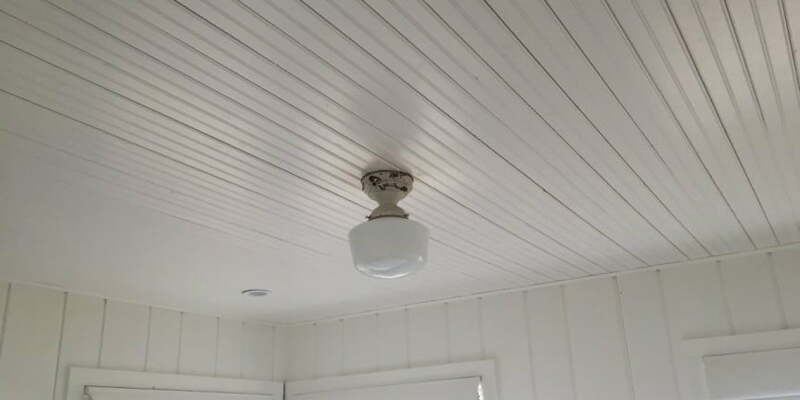 Read on to see a step by step how-to guide to installing beadboard ceilings in your cabin, cottage or home. Solid pine bead board from the Home Depot. For our cabin beadboard ceilings, we used 3/4″ x 4″ beaded tongue and groove pine boards. We ordered the boards from our local lumber yard. When ordering beaded ceiling boards, order boards long enough to avoid lengthwise seams. If seams are unavoidable, try and order tongue and groove boards that are “end-matched”. End-matched boards carry the tongue and groove to the sides of the boards, making end seams more stable. If possible, order boards that are just slightly longer than the needed ceiling span. Tongue and groove beaded boards are typically available in lengths up to 16′. Yellow pine beaded ceiling tongue and groove 3/4″ x 4″ boards from my local lumbar yard. When calculating the amount of material to order, remember that 4″ beaded tongue and groove boards provide only 3 1/2″ of a finished surface due to the tongue. Order a bit extra to cover for damaged boards and waste. You can always return unused boards. 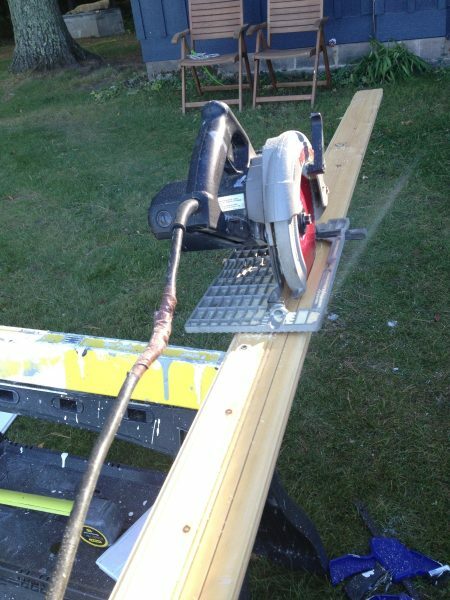 To fasten the boards, I purchased and used a pneumatic Bostitch 16 gauge finish nailer and 2″ 16 gauge finishing nails. I highly recommend using a pneumatic nailer if installing individual tongue and groove boards. 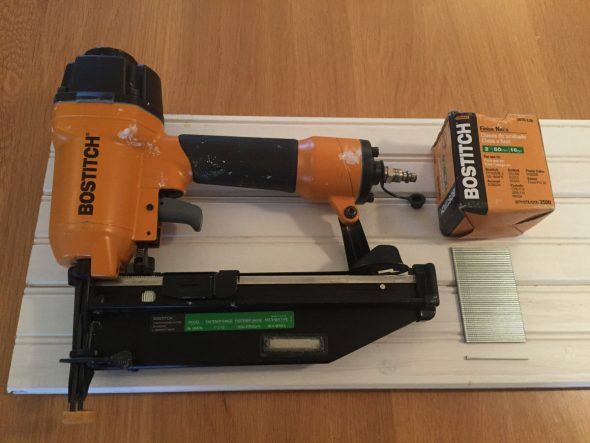 Bostitch pneumatic finishing nailer and 16 gauge 2″ finishing nails used to blind nail the tongue and groove boards. 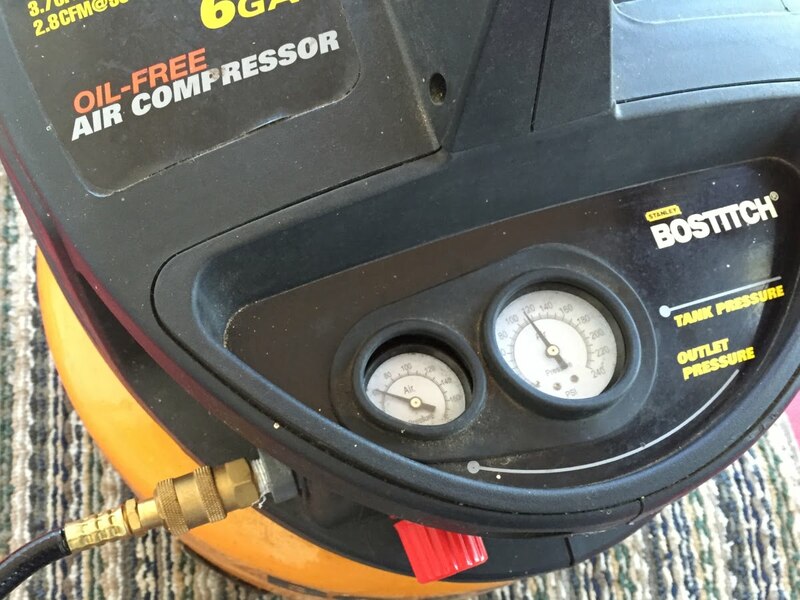 A pneumatic nailer allows you to easily set the nail head depth by adjusting the compressor regulator pressure. Adjust nail depth using compressor regulator valve. Proper nail head depth is flush or just below the tongue surface. Pre-finish, Pre-prime or Back-prime Boards Prior to Install if Possible. 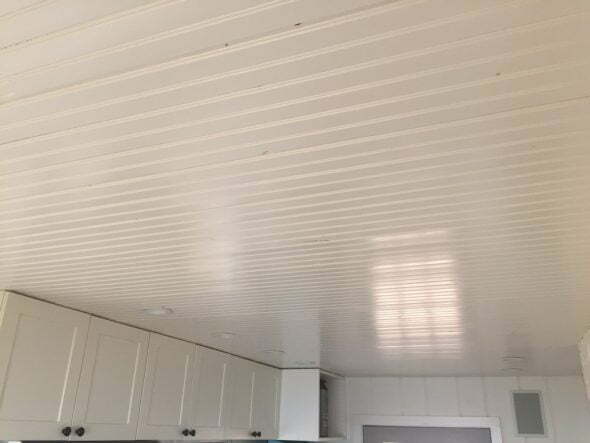 To improve the performance, appearance and life of your beadboard ceiling project, consider finishing or at least priming the boards prior to installing them. Sealed boards last longer and are dimensionally more stable. It is also a lot easy to apply primer or finish to the boards prior to installing them. And, once installed, boards that already have a coat or two of finish applied accept a final finish coat very easily. 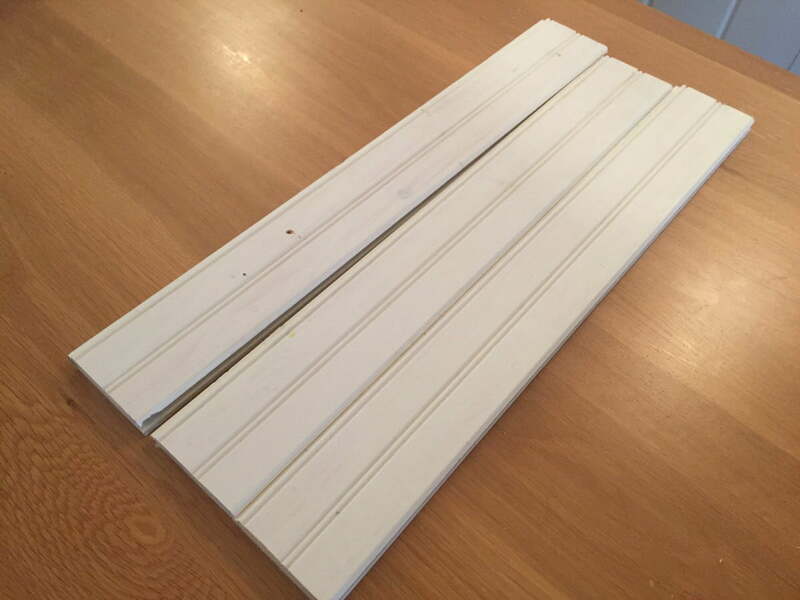 Pre-primed beadboard ready to install. 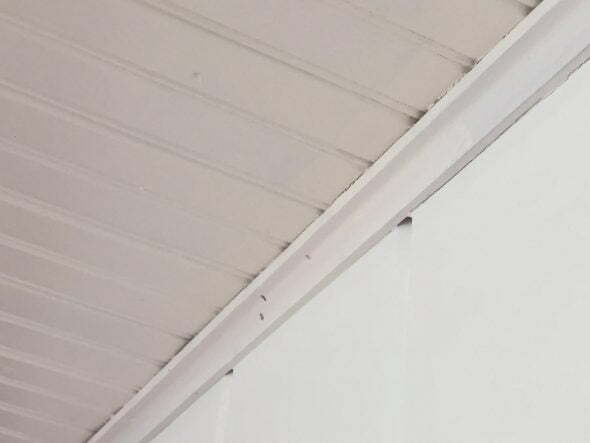 In addition, priming or painting the tongues of the boards will improve the appearance of your ceiling in areas where the boards separate with season moisture changes. To install tongue and groove boards properly, you will need to determine the direction and location of the ceiling joists. 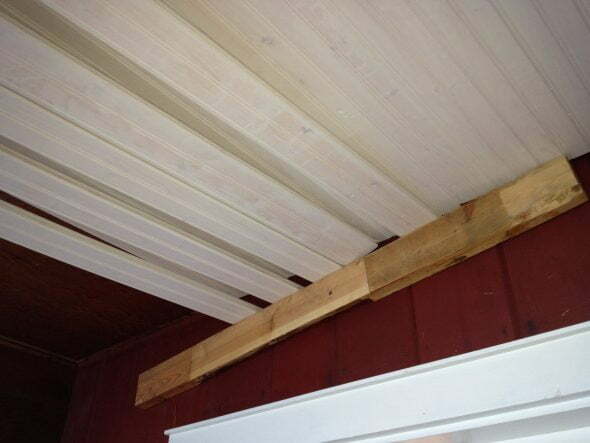 The beadboard ceiling boards should be installed perpendicular (oriented at a 90-degree angle) to the joists. This orientation allows each board to be nailed to the joists. Using a stud finder or other method, locate and mark your ceiling joists prior to beginning board installation. Use a caulk line or straight edge to mark the location of all joists on the entire length of the ceiling. Locate and mark ceiling joists prior to installing boards. Board should be installed perpendicular to the ceiling joists. Once the ceiling joists are marked, measure and cut the tongue and groove beaded boards for install. 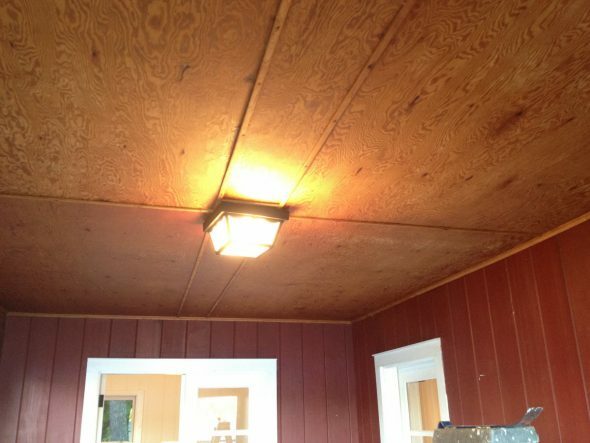 If possible, the boards should be long enough to span the entire width of the ceiling without seams. If you will need to seam boards, order end-matched boards that have tongue and groove sides designed for seaming. 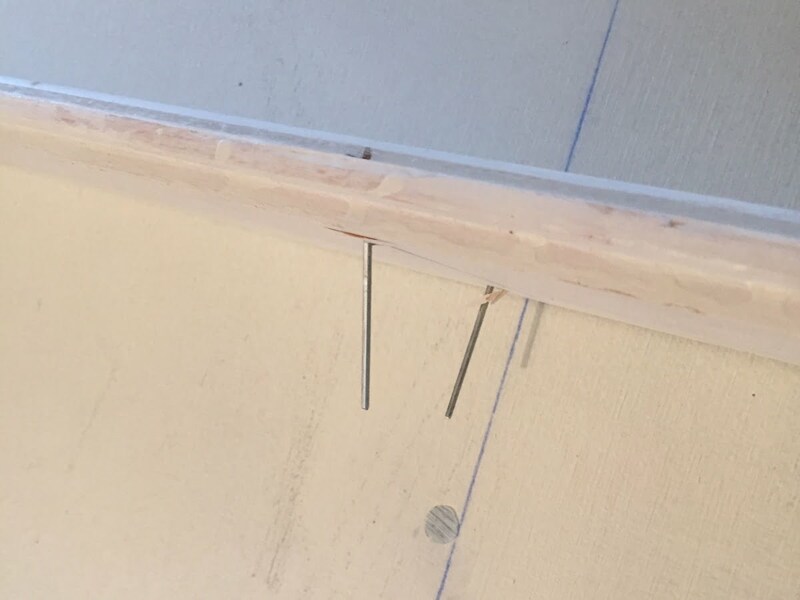 If you need to seam boards without end-matched ends, try and plan the seam to join over a joist so you can face nail the ends of each board secure. When making measurements for board lengths, remember to leave a slight gap on both sides of the board ends for possible board expansion. You can leave smaller gaps (1/4″ or so) for smaller widths and more moisture stable environments. Leave larger gaps (3/8″ or so) for longer board lengths and more dynamic moisture environments. Remember to consider the type of molding you plan to use will need to cover whatever expansion gap you plan to leave. Beginning at the wall on one end of the ceiling, start installing the tongue and groove boards. Remember that you will be installing the boards perpendicular to the ceiling joists, so pick the starting wall accordingly. Install the first board tongue out with the groove side of the board facing the wall. Leave a slight expansion gap (1/4″ or so) between the groove side of the board and the wall. Expansion gaps on the tongue and groove (start to finish) sides of the ceiling are less important because of the slight expansion allowed between the tongue and groove joints. Install the first board. First, center the board left to right, with equal expansion gaps on either side of the board. Square the board with the side walls. Then, nail the board in place. For the first board, face nail the starting edge of the board (groove side) next to the wall. These nails pass directly through the face of the board perpendicular to the board surface. Then blind nail the tongue, align your nailer (or nail if hand nailing) at a 45-degree angle through the base of the tongue directed back under the board. The starting board is installed groove toward the wall. Face nail the back edge of the board then blind nail the front trough the tongue of the board. Seat the nail head so that it is flush or slightly countersunk with the tongue surface so that it does not interfere with the tongue and groove joint. Once the first board is nailed in place, continue to add boards and nail them to the prior installed boards only through the tongue. This way, no nail head will be visible, except for the face nailing of the first and last boards. Prior to nailing boards in place, center them left to right, so the expansion gap at the ends of the board is similar. Once aligned, side the new board’s groove into the existing boards tongue and tap them together to tighten. Add boards one at a time, connecting the tongue and groove edges. Tapping the boards not only tightens the tongue and groove joint, but tightens the nails of the boards already installed. Blind nailed joints, with their 45-degree angle backward fasteners, tend to tighten when force is applied in the direction of the fasteners. To tighten the boards prior to nailing, use a scrap piece of the tongue and groove board as a tapping block and firmly pound on it with a hammer. The tapping block should be connected to the existing boards using the tongue and groove joint. Using a tapping board for tightening protects the tongue ends of the boards you are installing. Tighten the tongue and groove joints and the installed nails by pounding boards together using a scrap piece of tongue and groove board. Tap the newly added board tight, and then nail it in place. Nail the board at both edges and the intersection of every joist (which should be marked on the ceiling with chalk or a line). Ceiling joist spacing tends to vary between 12″ and 24″ depending on the joists and the span distance of the joists. Finish nailer used to blind nail boards through tongue into joist. Angle nail at approximately 45 degrees. Prior to installing any boards, you should mark the location of the ceiling joists on the existing ceiling using a chalk line or similar. Continue adding boards until you cover the entire ceiling surface. When you get close to the end of the ceiling, you will no longer be able to use a hammer and tap-board to tighten the boards. 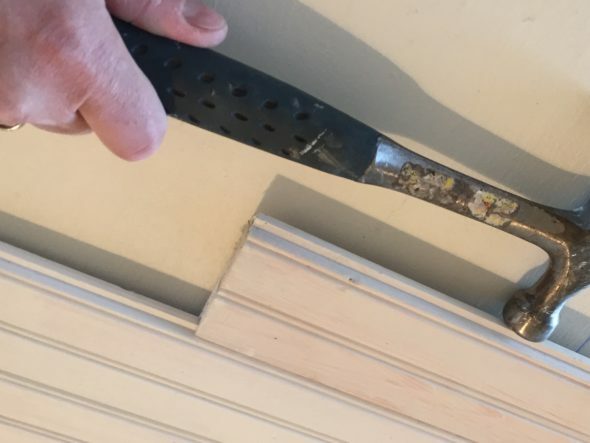 Instead, use the tapping board with a few pieces of scrap boards to create a space to pry the boards tight using a pry bar or similar against the wall and the tapping board. When you reach the end of the ceiling, you will likely need to rip (cut lengthwise) a board to fill in and finish the ceiling span. To do so, measure the needed width to fill in the final gap minus any expansion gap you plan to leave. 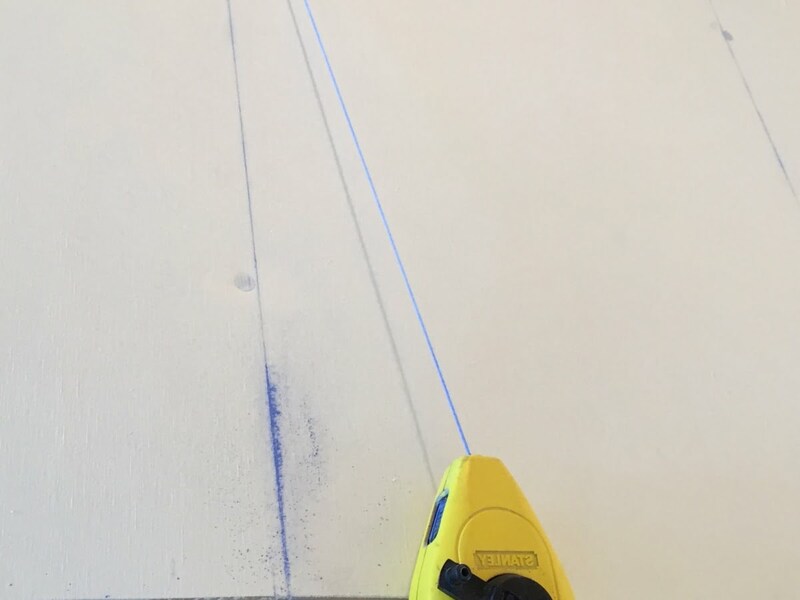 Cut a piece of beaded board lengthwise after measuring and marking the proper width. Don’t forget to consider the tongue and groove joint when making and marking this width. To make it easier to rip the final board, join the piece to be cut into another tongue and groove board. I then screw the stabilizing tongue and groove board to my saw horse using deck screws – just my way of doing it. Ripping the last piece. Attach it to another tongue and groove board secured to sawhorses to make it easier to rip. After ripping the last board, install it and face-nail the wall side similar to the first board. If the last piece is narrow, join the second to the last board to the final ripped board and install together. Use the wall to tighten the boards then face nail the final piece. If the final board is narrow, join it to the second to last board and install the two together. Paint the Installed Beadboard Ceiling. 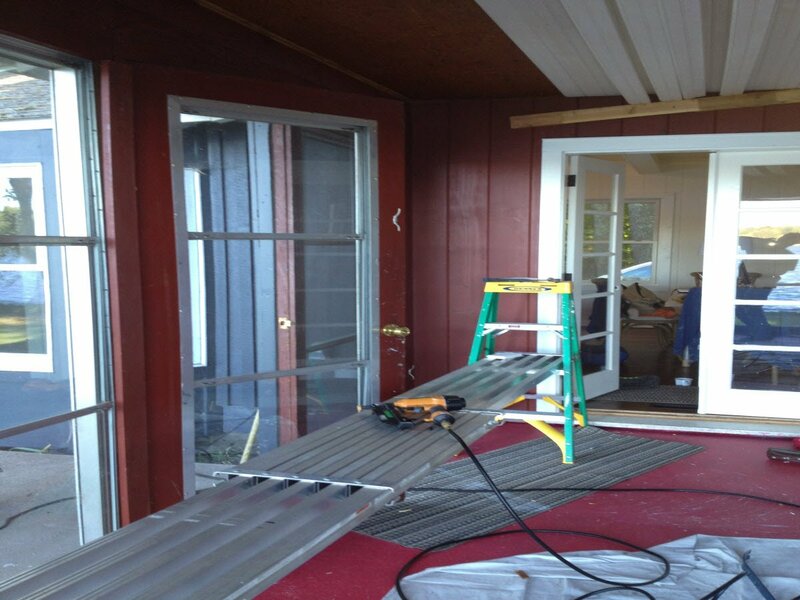 After the boards are installed, paint or finish as desired. 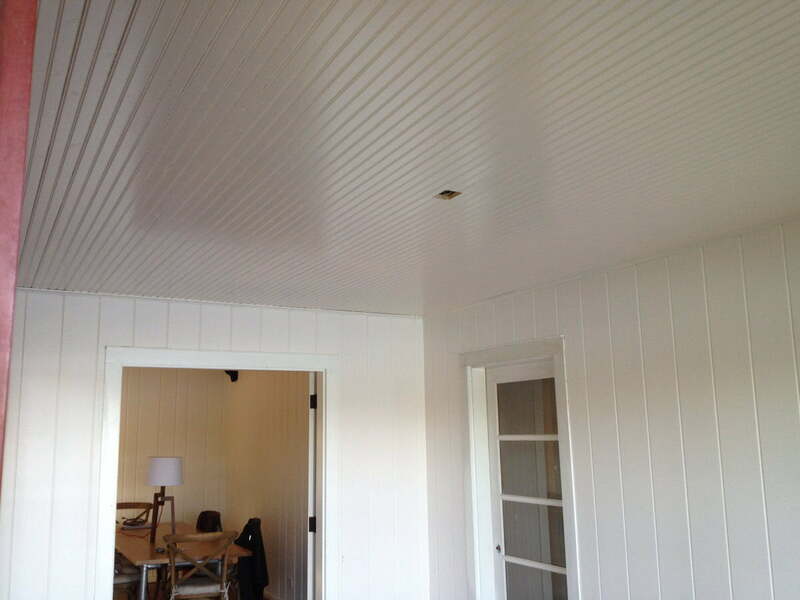 We painted the beadboard ceilings with Benjamin Moore Advance waterborne alkyd indoor paint tinted “White Chocolate”. With the boards already primed, the finish coats went on very easily. We two coats of finish applied using a 6 1/2″ Wooster mini roller with a 3/8″ nap roller. To cover the expansion gap between the ceiling and the walls and to finish the covers, add trim. There are many different trim options. We chose a simple 3/4″ quarter round trim. Similar to the beaded boards, I primed the trim prior to installing it. 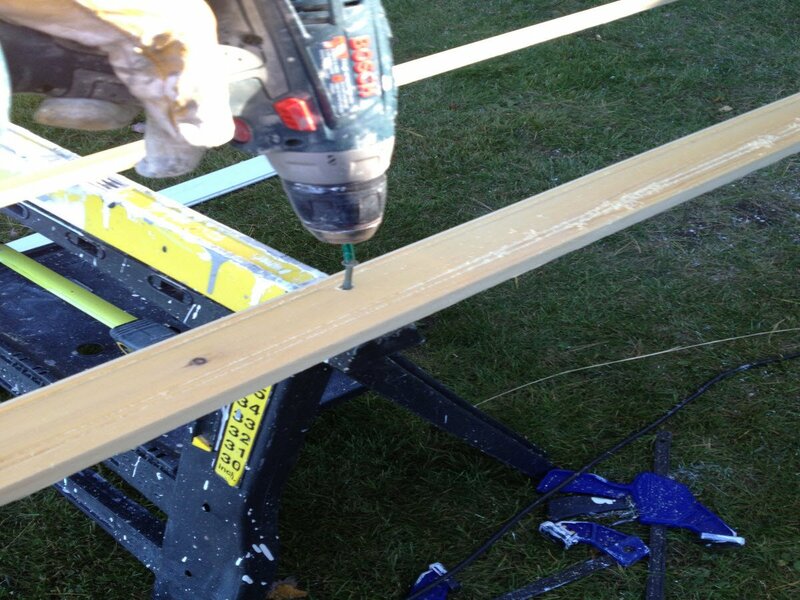 Use finish nails or the same finish nailer set up to install the trim. Nails should be slightly countersunk and covered with a filler or caulk. Counter sink trim nails then cover with filler and paint. Once the trim is installed, apply your chosen finish or paint. Beadboard ceiling in bedroom. Beadboard built with 3/4" x 4" pine beaded boards which were painted white. 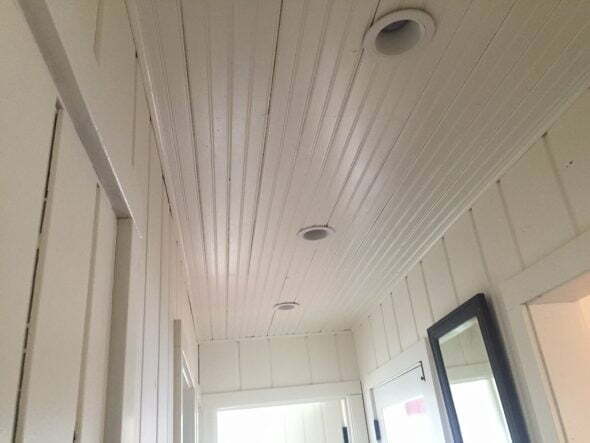 White beadboard ceiling in porch. Again, beadboard ceiling built using 3/4" x 4" beaded pine tongue and groove boards painted white. And in the kitche as well - white kitchen beadboard ceiling. Knotty pine 3/4" x 4" tongue and groove beaded boards. Pine beaded boards pre-primed before installing them. Bostitch pneumatic finishing nailer and 16 gauge 2" finishing nails used to blind nail the tongue and groove boards. Locate and mark joists with chalk line or similar prior to installing tongue and groove boards. View of nails for first board. Rear straight face nail and forward angled blind nail. Boards positioned, ready to install using 2 x 4s fastened to wall. Finish nailer, step ladders with ladder plank make installing beadboard ceiling easier. Ripping the last piece. Attach it to another tongue and groove board to make it easier to rip. Attach tongue and groove board to saw horses using deck screws as holder for final beaded board to be ripped with circular saw. Quarter round trim added to cover expansion gap and finish ceiling edges. White beadboard ceiling in porch after finish painting. Nice explanation – took you a bit of time to explain it very well – and you did. Thank you. The time required to install beadboard depends on so many variables it would be hard to guess. If you have the material ready to go and all the tools (nailer, compressor, a decent power miter saw, ladders, planks, etc) and someone helping, I would guess you could get it up in a few days. The biggest variable is the type of material you plan to use. If you do it like I did with individual boards, it will obviously take longer compared to larger panel material. 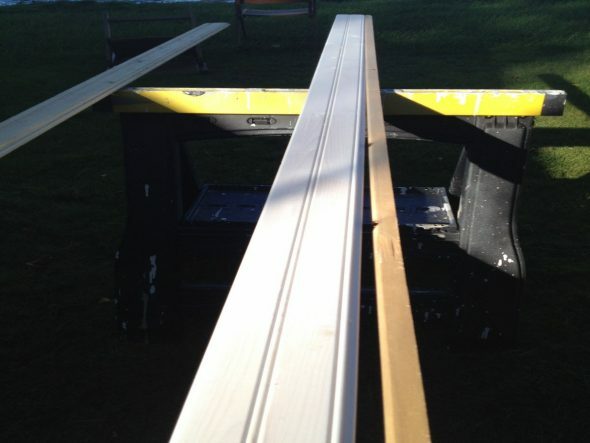 You can speed up your beadboard install by having your material finished prior to installing it. I primed all six sides of the material prior to installing it. This is especially important if you plan to paint the beadboard ceiling after the install. Remember that individual boards of your beadboard ceiling will expand and contract seasonally exposing more or less of the tongue and groove seems between boards. 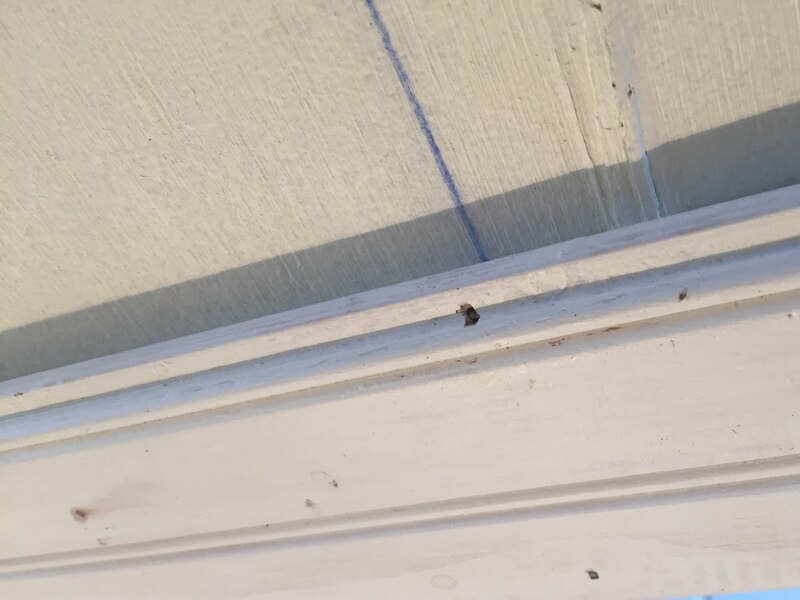 If you plan to paint the boards, it is a good idea to get at least one coat on prior to installing the boards. If you do paint the boards prior to installing them, use care not to obstruct the groove or build up the tongue too much as to interfere with the tongue and groove interface of the boards. In addition to having the material pre-finished, you can cut the boards to width before installation day, saving trips to the saw between each board. Remember to gap the walls by 1/4″ – 3/8″ or more depending on the run of the material, your climate and the trim you plan to use to cover the perimeter. I recommend a power compound miter saw if you can get one — even a inexpensive 10″ model will save time and produce infinitely better results compared to a circular saw. Also, a pneumatic nailer and appropriate compressor is a huge time saver compared to hand nailing. One more thing, a decent length plank, run between step ladders is another time saver. Finding a way to move the distance of the ceiling without having to move ladders will save a bunch of time and effort. Enjoy the project. Feel free to upload some photos if you have time. Can I install breadboard on the ceiling if I do not have drywall yet? I have the room roughed in with joists and insulation. That is all. Just didn’t know if I could nail it directly to the joists. 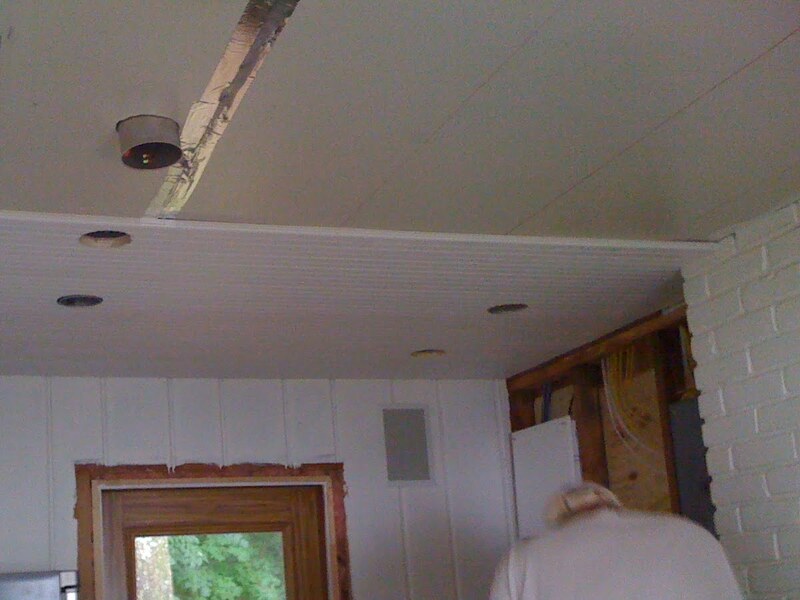 Yes, you can install a beadboard ceiling directly over the interior ceiling studs. You may or may not want to install a moisture retarder or barrier first, depending on your climate and the nature of the space above the ceiling you are finishing. If the space above the ceiling to be beadboarded is a conditioned living space (like an upstairs room), a moisture barrier is less important. Even if you do not need a barrier to prevent moisture passage, installing a moisture barrier product will limit air movement through the ceiling. The importance of limiting air movement through your ceiling again depends on many factors, with the most important probably being the nature of the space above the ceiling. If this space is a ventilated unfinished attic, for example, then a barrier to help limit air movement between the attic and the room you are finishing is more important. You noted that there is insulation in the ceiling, and if the insulation has a kraft paper backing, this will serve as a moisture retarder and will help limit air movement depending on the details of how it was installed. When you install the beadboard, plan the installation of the boards to be perpendicular to the ceiling joists to allow fastening of each board or panel. Enjoy the project and feel free to upload an image. Thanks for this super-clear explanation. A question: Could I use brads rather finish nails? I’m thinking nailing through the tongue with narrow brads would likely lead to less splitting. But I’m not sure if they would secure the beadboard properly. I live in a house built in 1906. The front and side porches are made with 4″ beadboard on the floor and ceilings. I have had to replace the floor pieces many times over the last 12 years because of rot. I have primed each board before application. Is this an incorrect use of this wood on the floor, and do you have any suggestions? Thanks in advance. Thanks for the question. What you probably have is wood flooring (often douglas fir) with “V” grooves between board for water drainage. Porches with flooring boards running perpendicular to the exterior wall of the home are often pitched away from the home with grooves to help facilitate water drainage. If you continue to use this type of flooring, priming the boards on all 6 sides is important. You will also need to keep the the finish fresh, especially if your floors are exposed to the elements and sun. If you are looking for additional options for your porch flooring, you could consider a different species of wood. There are many species that would likely last longer in this challenging environment. Teak, ipe, white oak, redwood and few others might give you better results. Ipe is an incredible wood from Central and South America that is fairly inexpensive, and will last for decades. You may also consider using a synthetic material for the flooring. There are many products that are used for decks that may work well for your porch. If you are planning to remove the existing flooring and start from scratch, I would consider treating the porch floor more like a deck and treat it accordingly with gapped floor boards that allow for air circulation and drying. Good luck, upload a photo if you like. As far as a recommendation for your porch flooring, I would attempt to figure out why the flooring is failing and proceed accordingly. If I had to guess, I would assume the flooring is exposed to moisture – either from below or exposure to the outside. To remedy moisture issues from below the flooring, I would consider adding some exterior grade sheathing and a moisture barrier. Great article! I’m in the process of installing T&G pine breadboard on our patio ceiling. I’m still in the very painful process of staining the pieces and have learnt a lot from your post. I live in FL and exterior walls are stucco on concrete block. Given that I’m using pine and it’s a humid climate, I know I need to leave some room for the wood to expand. My question is how/where to attach the trim pieces. Do I nail them into the ceiling boards or attach them with liquid nails to the walls? If the trim is made from wood…wouldn’t these pieces also expand and contract? So how do you avoid gaps if trim also “shifts”. Congrats on the project and thanks for using our site. 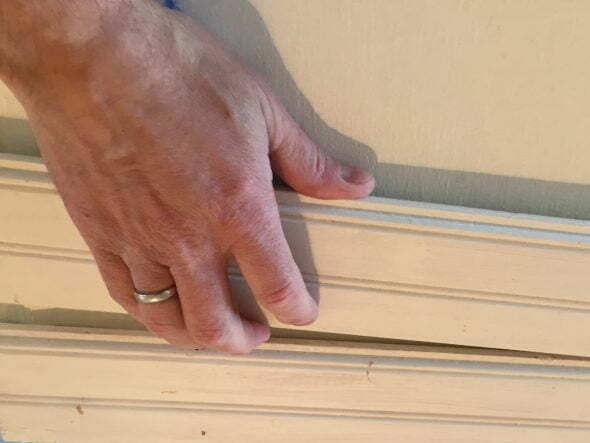 Regarding the trim (and I am assuming we are speaking about ceiling molding at the corner interface of the ceiling T&G boards and the wall – for example, ceiling cove molding), I would recommend nailing at the center of the molding with the nail aimed at a 45 degree angle back into the ceiling framing, avoiding the T&G boards. This way the T&G boards are free to move under the molding. This technique is probably most important when covering the ends of the T&G boards, since molding running parallel to and attached to a single T&G board should not influence movement across the ceiling as the boards are free to expand and contract within the tongue and groove intersections. I would not glue the boards if possible, especially at the two sides covering the T&G board ends as it may also restrict board movement and likely pull the molding away from the walls. If you needed to use glue, I would use care just to glue the edge of the molding against the walls and leave the surface covering the ceiling T&G boards unglued to allow for board movement. The T&G boards do move, but depending on the style of molding you plan to use, there should be sufficient coverage to avoid gaps with board movement. The best advice I can give is to carefully prime all six surfaces of the T&G boards before installing them. I actually applied 2 coats of the excellent shellac primer, BIN Zinsser. 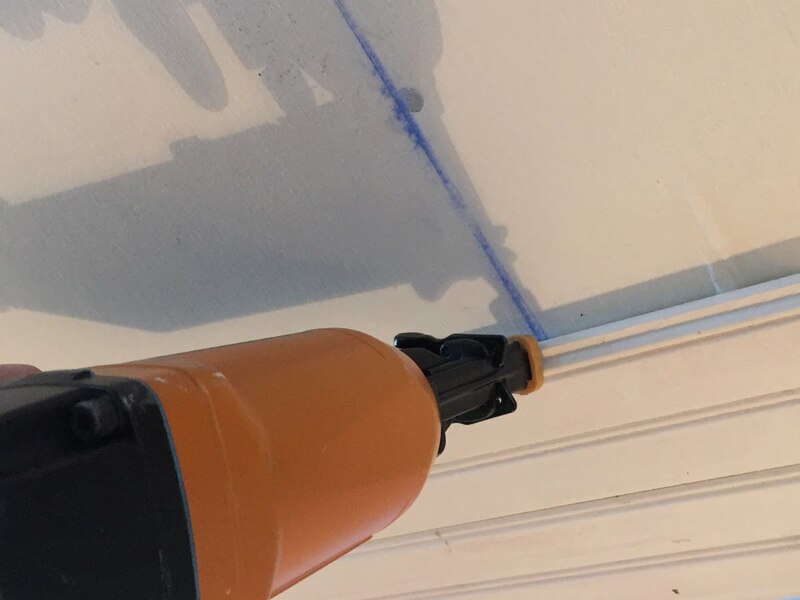 Not only will the primer greatly prolong the life of your Tongue and Groove ceiling, but it will also limit some of the movement of the boards due to moisture and temperature changes. And, if you plan to finish paint your ceiling white, it will hide the raw wood that otherwise might have shown with movement at the tongue and groove joints. Thanks for the quick feedback and additional insights! It’s dark out already…and I didn’t want to wait to send the images…so I mocked up the current situation. The first image shows the patio ceiling I’m working with. The red dotted lines are the joists and the blue lines is my current placements of 1×2 pressure treated strips. These are screwed into the joists with 3 in deck screws at the intersections. I opted to do this because I needed the beadboards to run parallel to the joists….for aesthetics as I could fit a full 10′ board across shorter distance in one piece…rather than having to run multiple boards with miter cuts length-wise etc. That’s why I was wondering if gluing the molding to the side wall (not to the ceiling) right below the T&Gs would work best…? As far as preparing the wood…I’ve given the boards 2 coats of semi-transparent deck stain on all sides…including inside the grooves and on the tongues….that’s why I said it has been very painful thus far. I plan to roll on a satin clear coat of some sort after they’re all up as well. I’m still struggling with this project and I can only assume it’s due to the poor quality of the wood I got from a big box DIY store. The first 5 boards went in very smoothly. However that was it. Every other board does just not want to cooperate. If I get one side of the groove over the tongue of the previous board, the other end of the board just pops out…the boards are just crooked it seems and I’m almost at the point of throwing in the towel. Did you encounter a lot of crooked boards as well or is this purely a result of getting them from a big box store and not a lumber yard? My paneling was already installed and is thicker cedar. 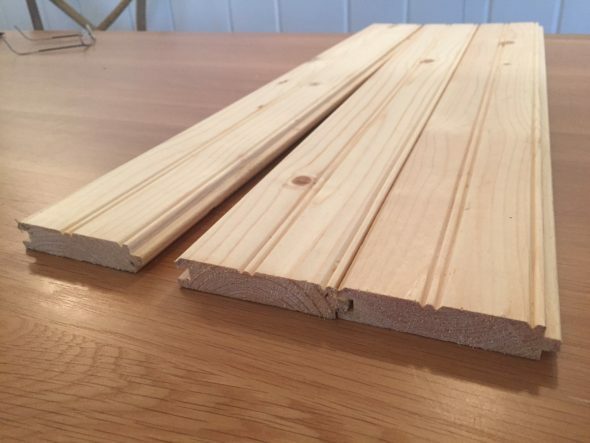 If you are having trouble with crooked boards not lining up well, I would recommend inserting and fastening one end of the board (top or bottom) first, then work your way down or up the board, progressively fastening as you go to straighten the boards as you install. The moisture content of the paneling may also be an issue and the boards may benefit from a period of acclimation to your home prior to installing. Sorry you are having difficulty. It may be worth finding some better quality paneling from a local lumber yard.